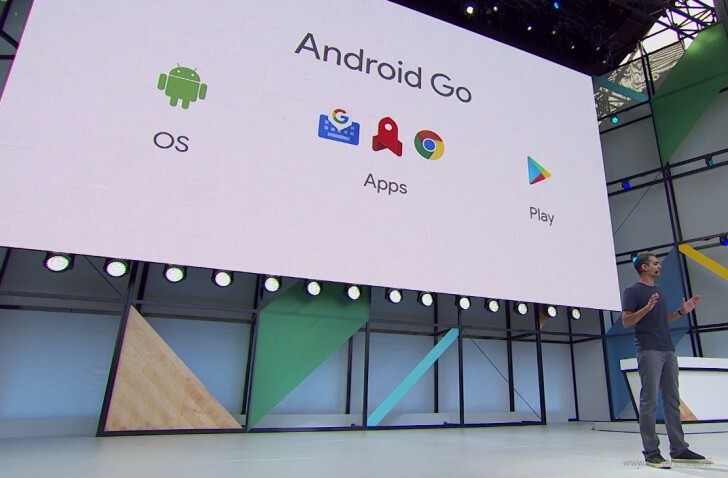 At its IO developer conference today, Google has unveiled Android Go. This is an initiative that seems to have been created in order to fill the void left by the Android One program, which hasn't resulted in a new phone in a long while. Nevertheless, Google isn't calling this Android One 2.0, so there will be quite a few differences between One and Go. Google said it's been inspired a lot by the YouTube Go app when developing Android Go. Every single device launching with Android O and later OS versions which has 1GB of RAM or less will get Android in the Go configuration (and you can even go as low as 512MB of RAM). So what is this Go configuration? Basically the operating system is tuned to work with lesser hardware as well as very limited network connectivity and small data plans. You will get data management in Quick Settings, and an API will be made available to carriers to tap into this. So you'll always know exactly how much data you've still got in your plan. What's more, you'll even be able to quickly top-up your data allotment inside Android's Settings - without the need to call your carrier or visit a store. The Data Saver feature will be on by default in the Android Go configuration, and Google promises it will "Go-ify" all of its preinstalled apps, building upon the lessons it's learned from the rollout of YouTube Go. If third party app developers want to get their creations showcased inside the Play Store to owners of Go devices, then they should adhere to a Google Best Practices document called Building for Billions. This basically means that they should take into account things such as limited network connectivity (and small data plans), as well as low use of hardware resources, when building their apps. The first Android Go devices are going to arrive in 2018, Google says.